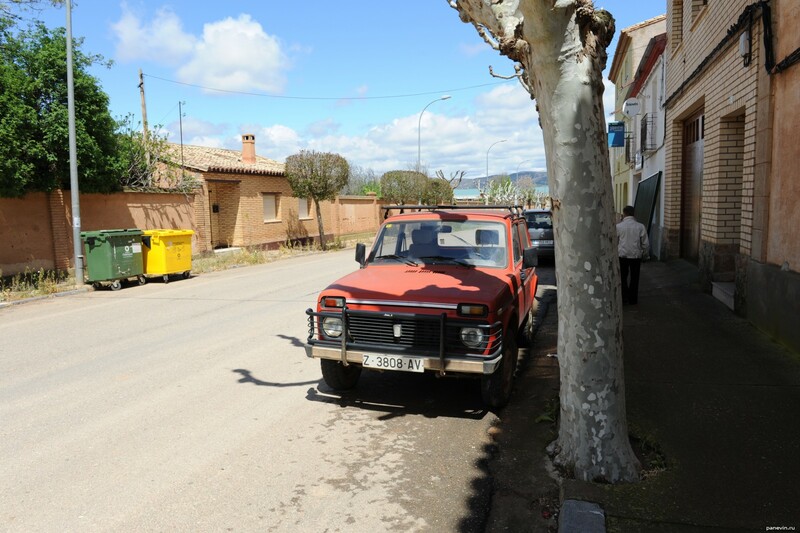 Traditional scientifically-informative ethnographic post about roads and automobile movement: Spain, features. 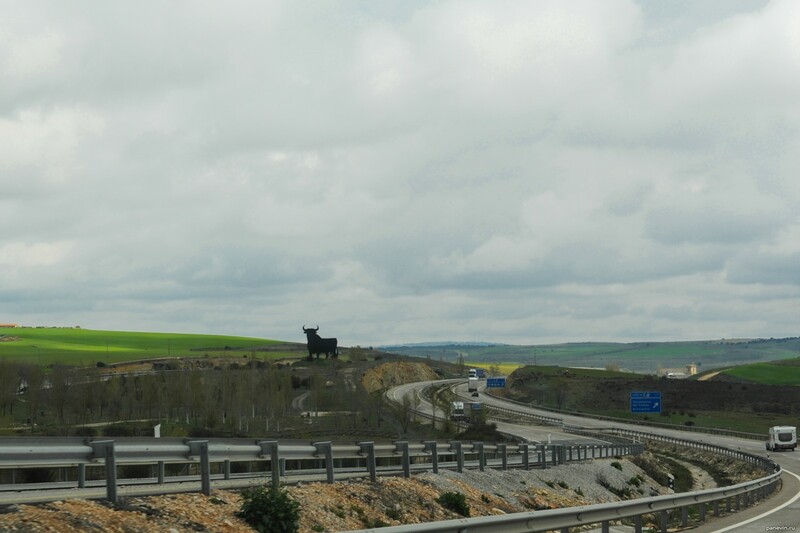 Spanish roads are very good, but one Spaniard tald me that in Germany highways better. Ahead airplane landing in the airport of Madrid. 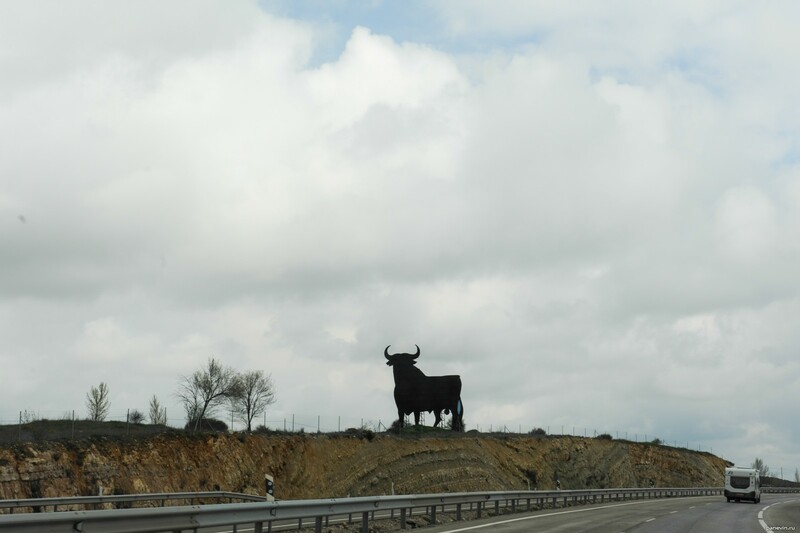 On roadsides was huge bulls — a symbol of Spain. 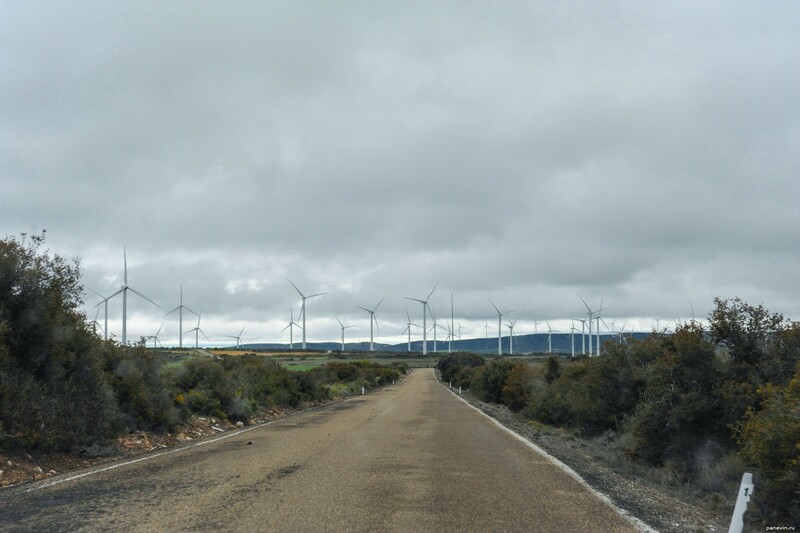 Often came across the whole glades of huge wind-driven generators. 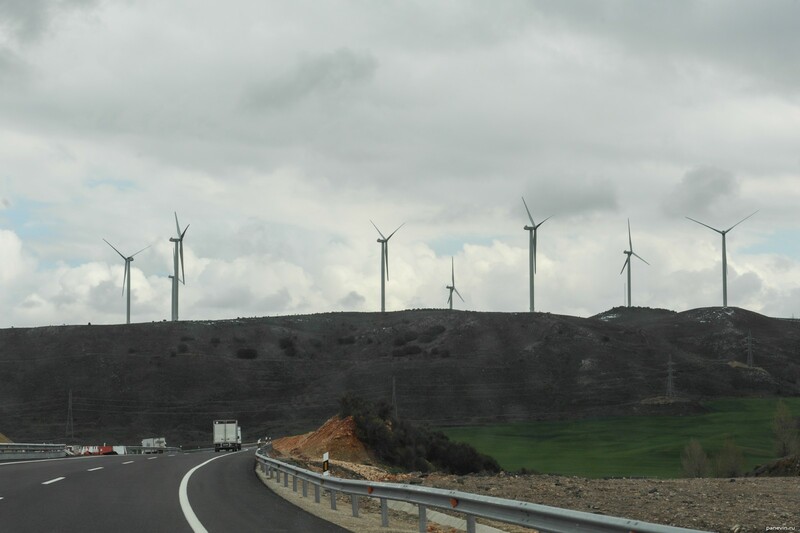 Classical landscape modern Spain — huge bull and wind-driven generators. Hard has brought on a country road. At the earth the surprising brown-orange shade shining on the sun. 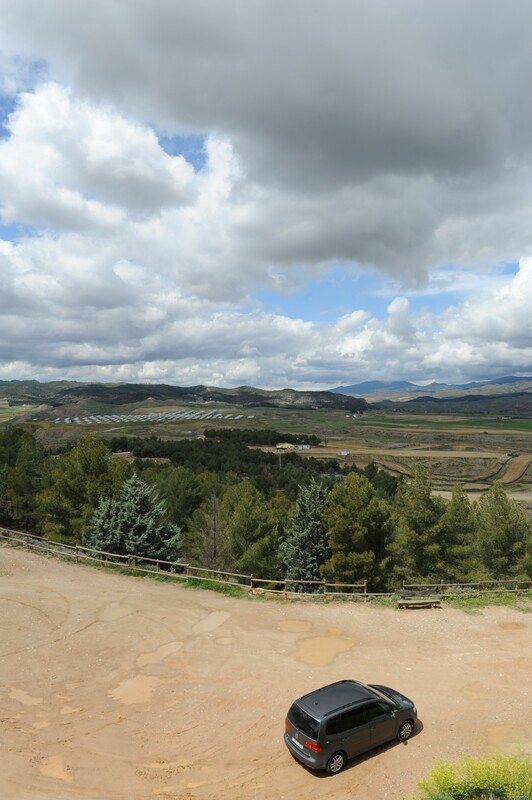 Already typical Spanish landscape, invariable centuries: green space, in the distance mountains and ancient castle on a hill. There is no hill without castle. Impressing aperture! 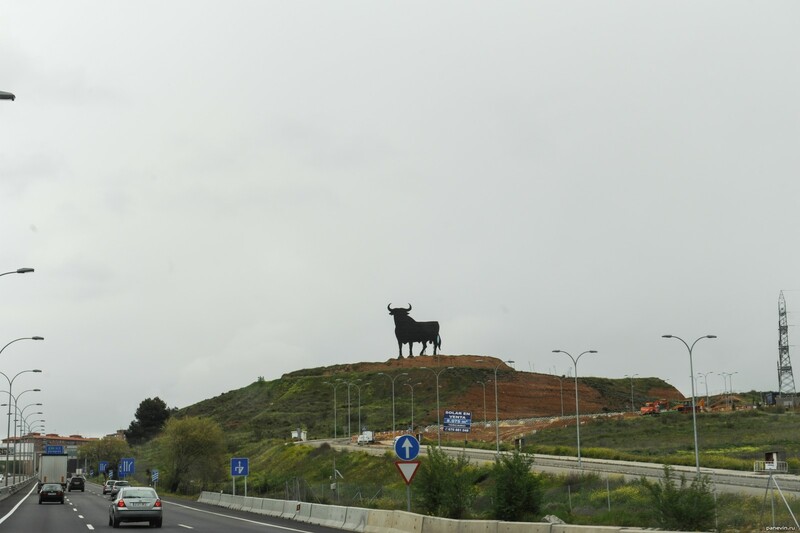 I represent how many work and a hemorrhoids needed to Spaniards built roads through set of mountains and rocks. 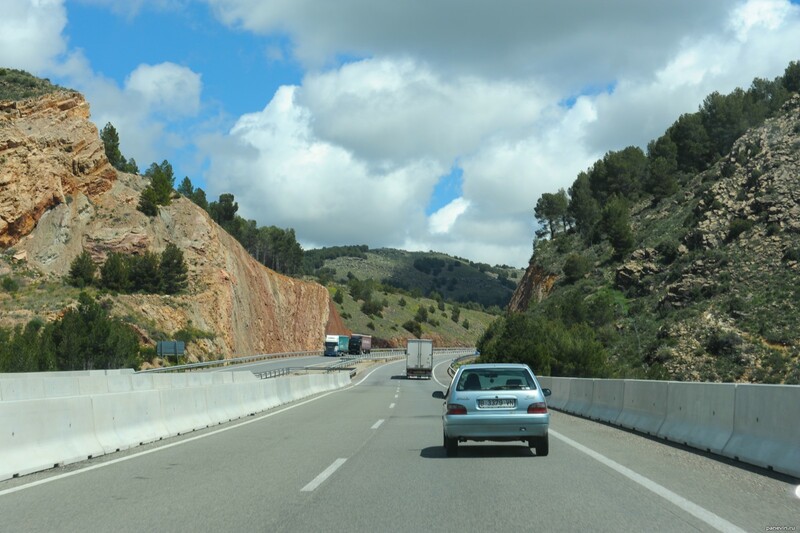 In Finland many similar views with rocky walls along the edges of roads, but with forests above. Parking. 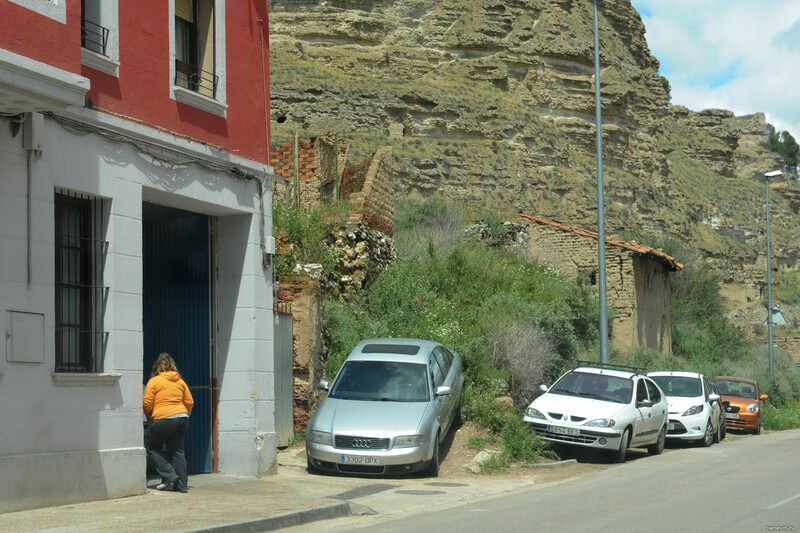 Spaniards in respect of a parking are very disciplined. Penalties! 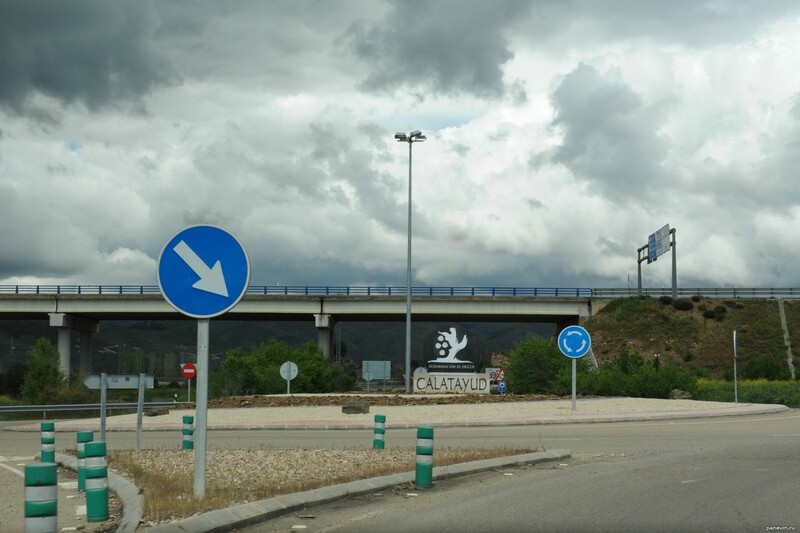 In Spain in suburbs and outside of settlements anywhere is not present crossroads. In general anywhere! Everywhere a circular motion (3 and more directions). Same it is ingenious! 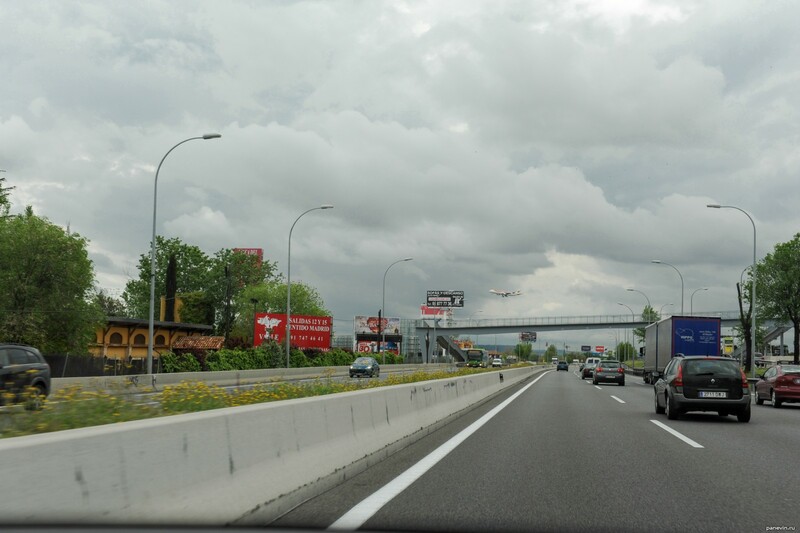 Safety of traffic raises in times. There are also such wow: 7 (seven!) directions. At me already eyes were approximated. Except an abundance of signs, on roads an excellent clear marking. 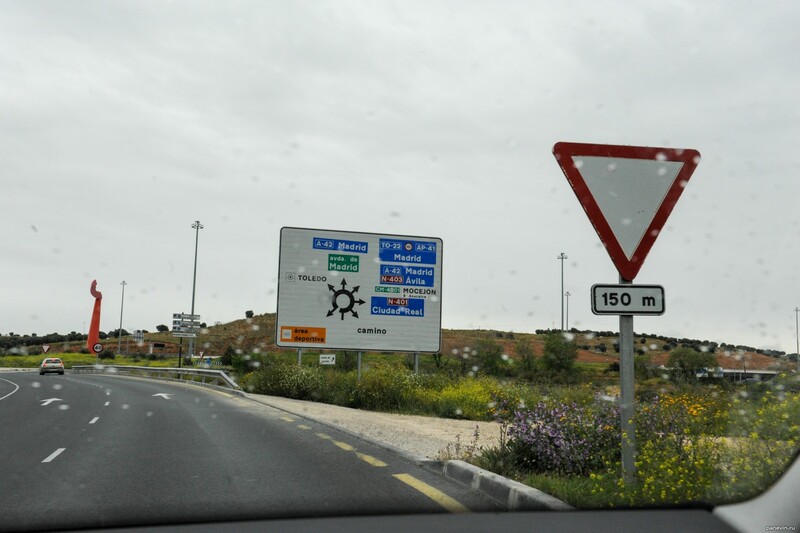 Before departure on a circle, on asphalt the huge triangle is necessarily drawn «give way», if you have suddenly blunted who whom passes (in Europe a circle is main, at us still couple of years was on the contrary). 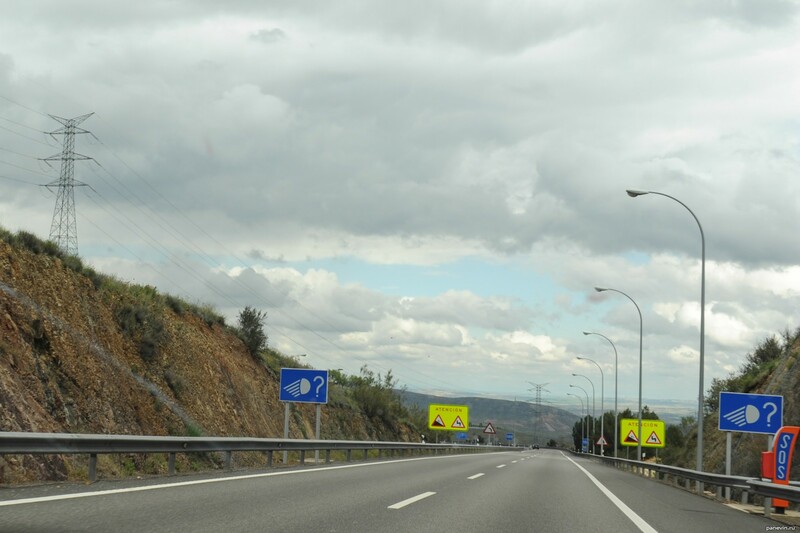 Road signs in Spanish roads are very good, understandable and that is very important — huge size. Reminder to use headlights. At the left there is a safety communication pay phone, frequent on roads. 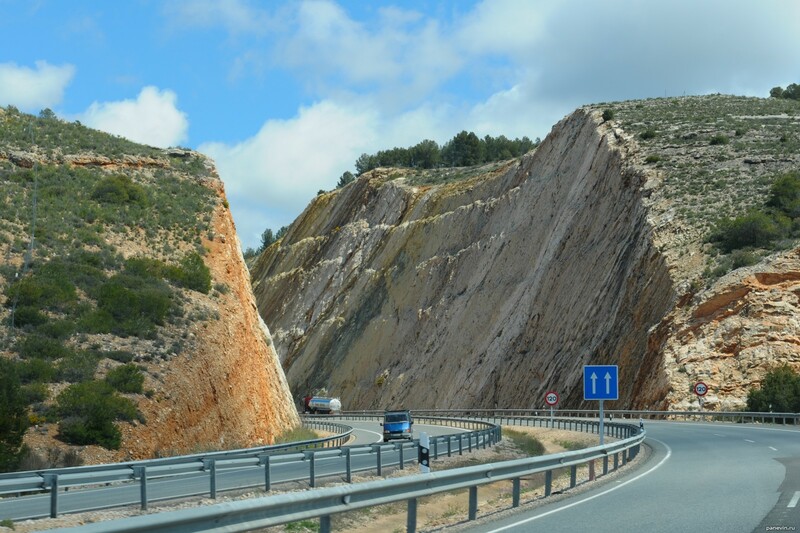 Whether it is not enough that with cellular communication, and roads to mountains always a source of dangers (fog, ice, rockfall, landslips — everything). 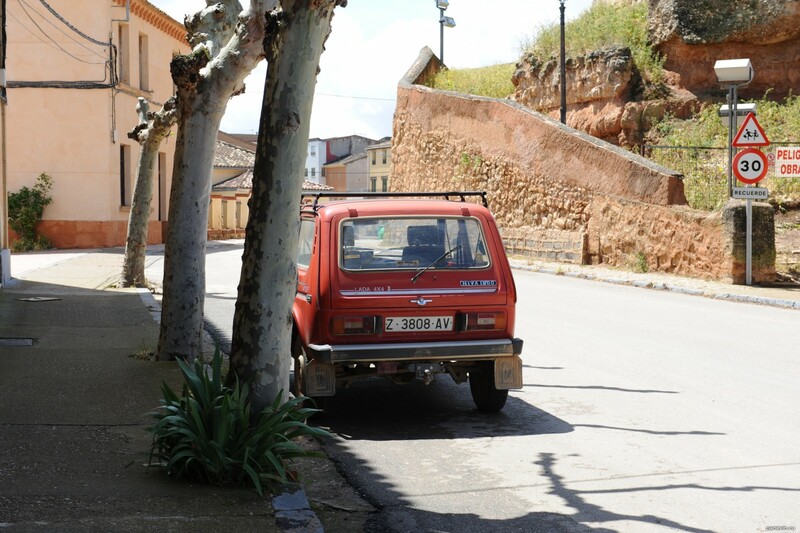 In small town Setina I meet Russian car Niva! 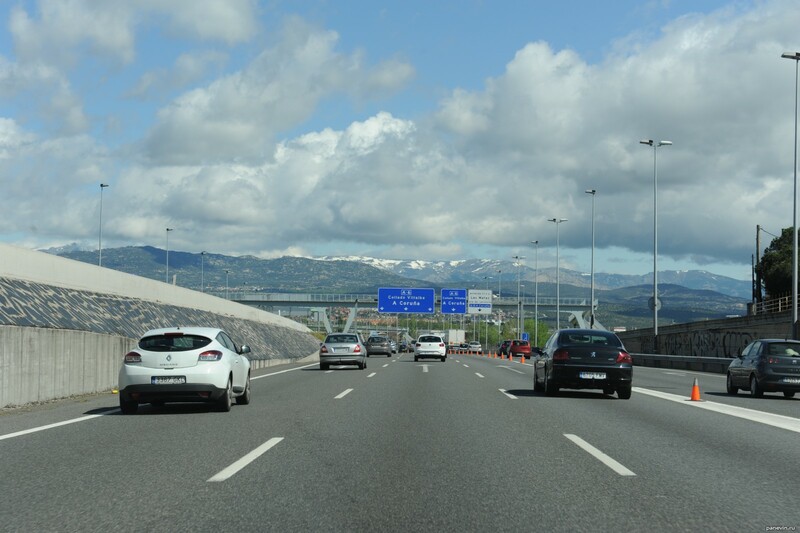 Very much was surprised, though for foothill areas Spain it is the ideal car, all the same not a parquet crossover, and high-grade 4х4. 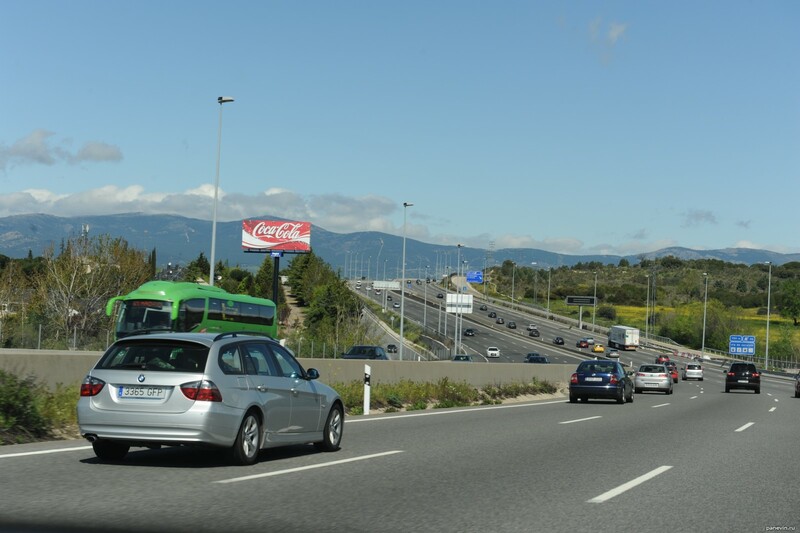 In the Spanish cities the public transport with the allocated lines which as a rule have been fenced off by columns or dividers (only for buses, trolley buses and taxi) is perfectly adjusted. 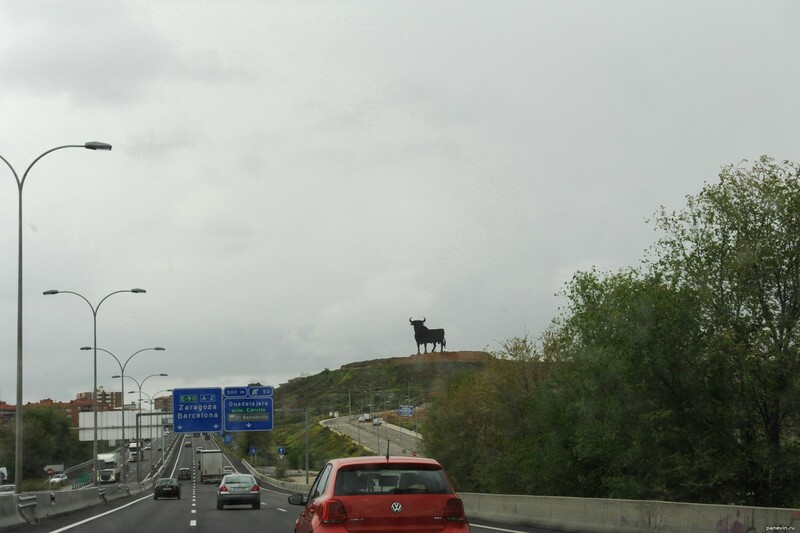 Taxi, for example in Madrid, is a lot of! 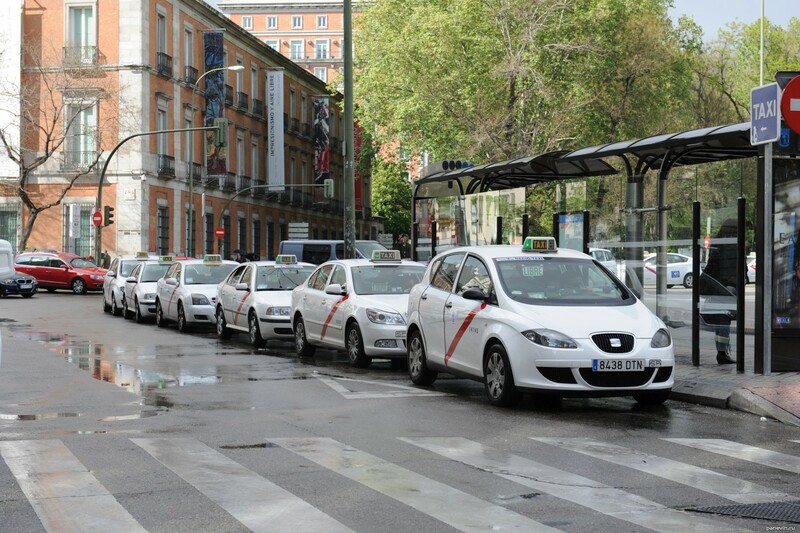 All taxi in Madrid white colour with a small red strip on-diagonal and municipal arm on a door. 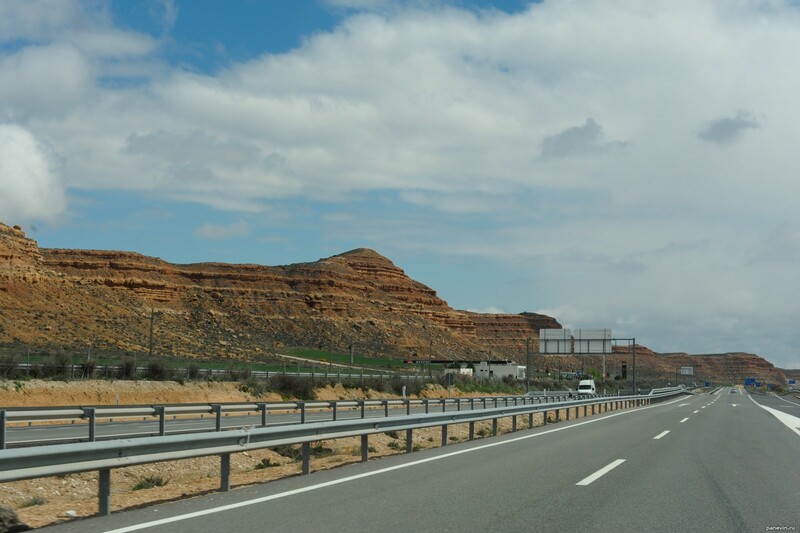 In other cities the same, only strips of other colour (in Zaragosa, for example, lilac) and the arms, accordingly others. 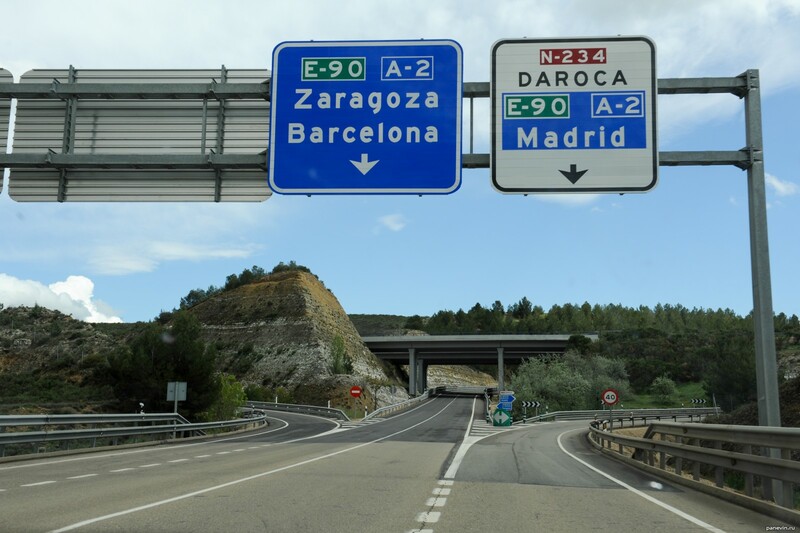 On Spain built the branched out network of high-speed trains, I from Madrid in Zaragosa drive by car about 6 hours, and by train would reach 1,5-2 hour. 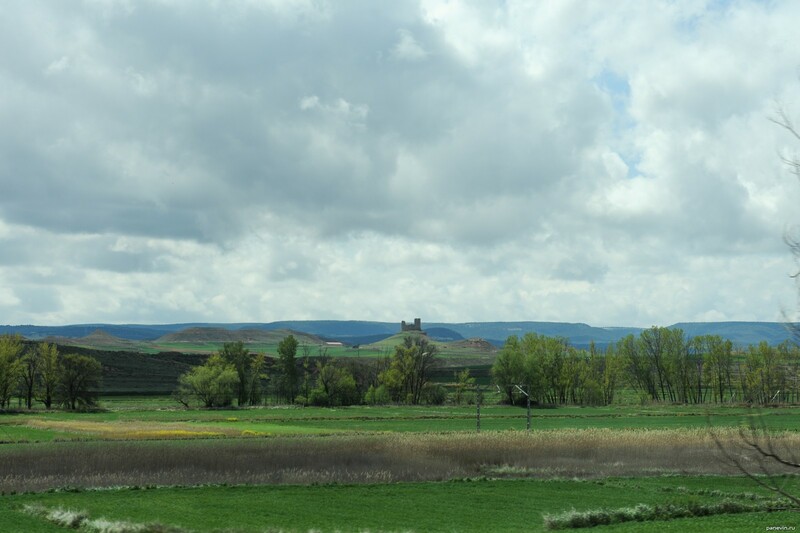 But by the car it is, of course, more interesting — it is possible to turn in any interested small town, to have a rest, take a walk. 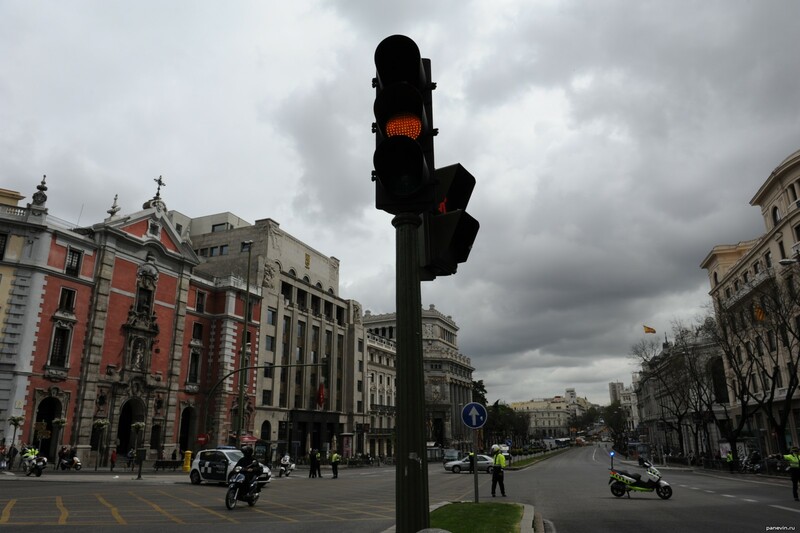 In the Spanish cities often there are smart duplicated traffic lights. 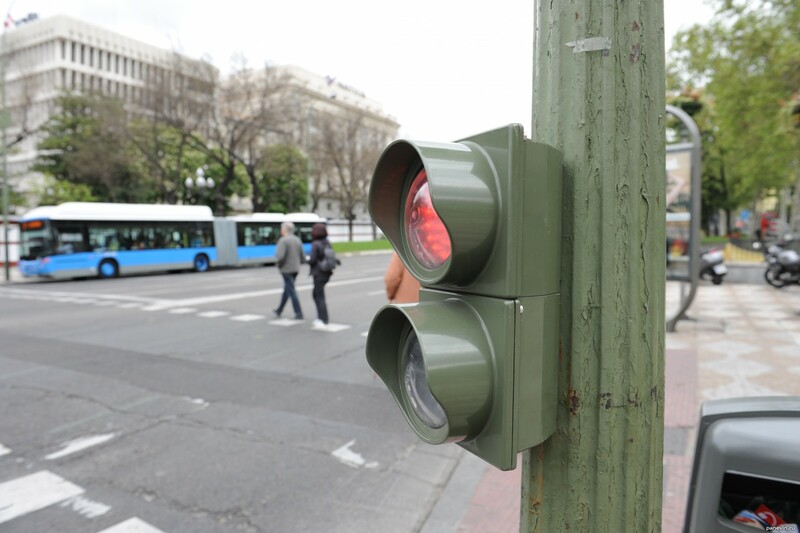 The basic traffic light at height of two metres, and under it a small traffic light at level of eyes of driver. The basic traffic light. This is not duplicated because stand on a dividing line, duplicated on the other hand roads. 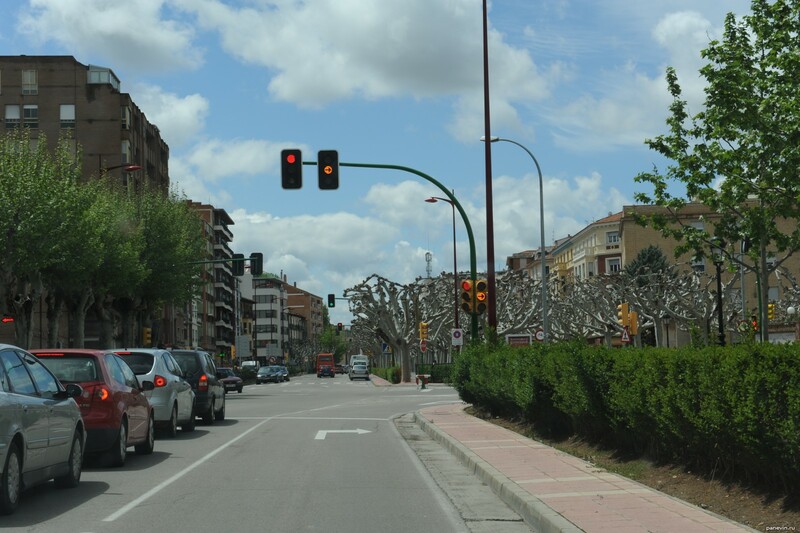 Or here such threefold traffic light in a city Calatayud. Over the road, one vertical column and under it duplicating section. Rented car was Volkswagen Touran — rare model in Russia, and auto was pleasant. Very convenient variant if to go with children — behind 3 places. Minus one: seats — as in the truck. Rent, actually, as everywhere in Europe — is better to be puzzled in advance and to reserve by the Internet. Or directly at Hertz, EuropCar, or RenalCars (or other big). Important — force the manager to write ALL demages on the rented car, if you wouldn't want to lose money. 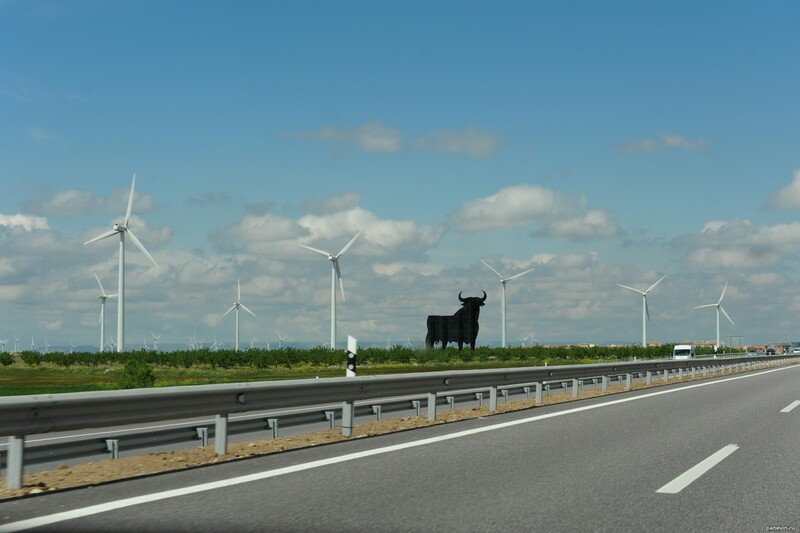 Modern photo cars, Europe, Spain.